I scream, you scream, we all scream for ice cream! 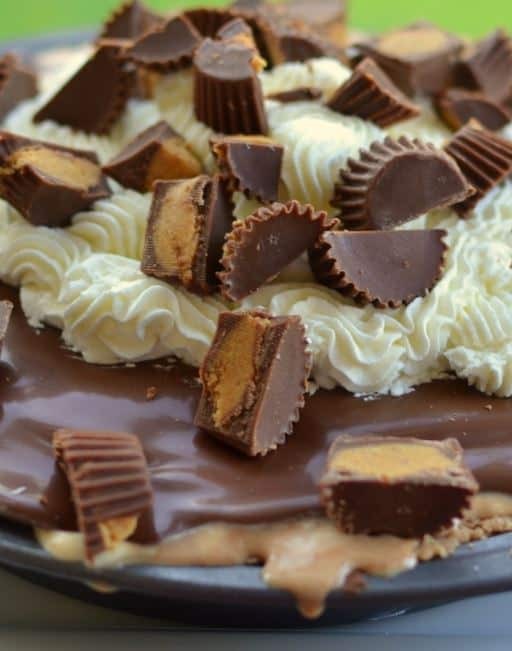 This Reese’s ice cream pie is what it is all about. 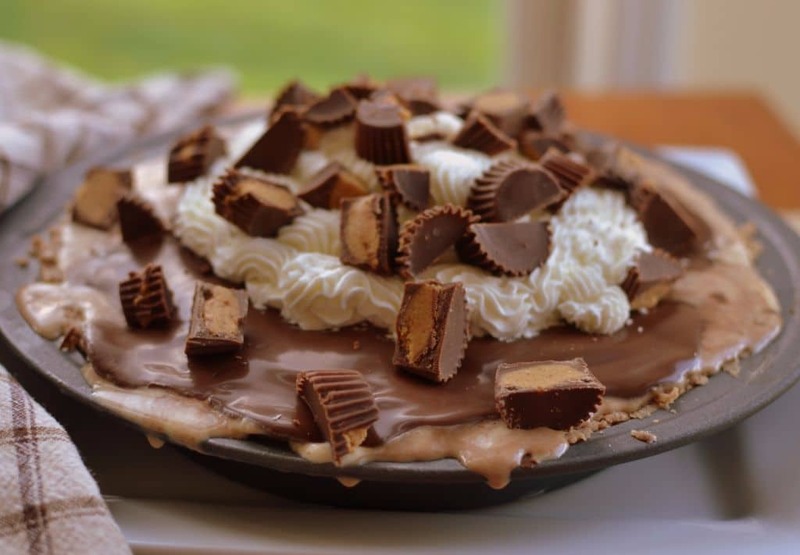 The delectable treat starts with a cookie crust crushed with Reese’s peanut butter cups. 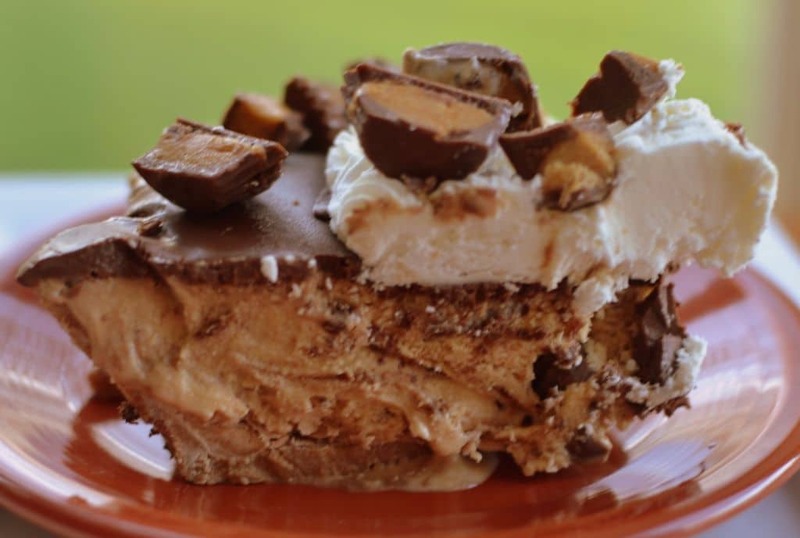 Followed by a layer of Breyers Reese’s peanut butter ice cream. The ice cream is topped with a layer of chocolate ganache and whipped cream. Finally the beauty is topped with more Reese’s pieces. The end result is a rich decadent ice cream treat! It is perfect for your next party or soiree! Anytime is perfect for ice cream! Anytime at all! In food processor combine sandwich cookies, butter and Reese’s peanut butter cups. Pulse several times to combine. Press into metal pie plate. Freeze for about one hour. Take ice cream out of the freezer and allow to thaw for 10-15 minutes. Gently press into frozen crust. Use heated spatula to smooth out. Place in freezer for 1 hour. Place chocolate chips in small bowl Heat whipping cream to boiling in small saucepan; stirring constantly. Pour over chocolate chips; whisking to combine. Allow to cool fully. This make take several hours. Do not refrigerate as you will not be able to pour it. It must come to room temperature. Pour over frozen ice cream pie and place ice cream pie back in freezer. Chill mixing bowl and beater for at least 20 minutes. Whip cream and powdered sugar until stiff peaks form. Pipe or spoon over the chocolate ganache. Top with Reese’s pieces and place in freezer to set everything for at least one hour. Remove from the freezer for 15-20 minutes before serving. Use a heated knife to help slice. Could you please send me your ham salad recipe. I am having a baby shower. Thank You. I did. I hope you got it. Make sure to use good quality ham or you will end up with too much moisture.